Whether you are into scrapbooking, card-making, or both, you will love our selection of craft rubber stamps. At CraftDirect.com, we have a number of solutions for paper crafters, including interchangeable cling rubber stamps, or make your own with stamp-making machines. You can add the perfect detail to your project. Place it on your stamp mount (the acrylic block). Evenly press your stamp on your designer paper. Remove the cling stamp from the acrylic block and clean the rubber stamp off. Now you can use the same block as a base for a new stamp design. Pro tip: use the Sizzix Stamper's Secret Weapon to make this process easy and clean. If you have more questions about how to use rubber stamps for craffts, please contact us. 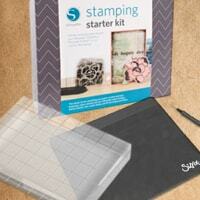 Sizzix rubber stamp sets - this is an easy solution that works for every kind of crafter. Framelits Dies w/ Stamps - if you have a die-cutter/embosser, this is a great way to go because you can cut and then stamp coordinated designs. Silhouette Mint stamp making system - create your own stamps! Stamps are very affordable, so making your own is not really a cost-saving solution, it's more of a creative benefit. You can make just about anything that you find in the Silhouette Design Studio. 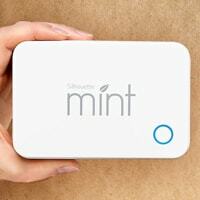 Just like with the scrapbooking stamps from Sizzix, Mint stamps require an acrylic mount and need to be cleaned between uses. Cut out your design, then stamp it. In addition to all that, we have stamping accessories that will make your projects easier. Getting the right message across is so important to creating the perfect greeting card. We offer the best craft rubber stamps for card making and they will enhance your projects. 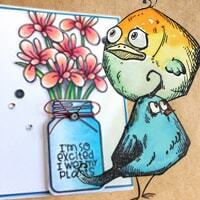 If you are looking for a fun solution, try the Tim Holtz Crazy cling rubber stamps to decorate your scrapbook layouts. You will love the fine detail it provides and the designs are so comical, they are sure to bring out the smiles.